Foragers Cottage at Bay Tree Cottage Accommodation in Farthingstone, near Towcester, Northamptonshire, sleeps 6 people. Bay Tree Cottage Accommodation near Towcester is ideally located in the heart of the Northamptonshire countryside in the delightful small village of Farthingstone, close to the county borders of Oxfordshire and Buckinghamshire. This new development of three wonderful and comfortable single-storey properties are within the owner’s smallholding and can be booked individually or together catering for up to fourteen guests. They have been designed and built sympathetically to the local area incorporating a wonderful balance of old traditional materials with new modern fixtures and fittings. All three properties share a lovely patio and courtyard area where you can dine al fresco making use of the barbecue, or enjoy a drink in the sunshine after a day exploring the area. Baker’s Den (ref UKC3195 [Bakers Den]) enjoys high vaulted ceilings and is a lovely cosy one bedroom studio. Next door is Weaver’s Retreat (ref UKC3196 [Weavers Retreat]), a two bedroom property each boasting their own en-suite shower rooms, and perfect for friends and family to enjoy also with a sofa bed in the living room. This property is also suitable for wheelchair access with one of the en-suites being a large wet room. The largest property; Forager’s Cottage (ref UKC3197), has three bedrooms, two doubles and a bunk bed, with enough height for adults to have a comfortable stay. One of the doubles has an en-suite shower room plus a separate family shower room, perfect for groups and larger families. The owner can arrange use of the studio/workshop adjacent to the properties for communal dining and events. The owner also runs a variety of workshops including arts, crafts, gardening, floristry, foraging and cookery, which can be organised with the owner directly. There is a wide range of local activities and attractions in the area including walking and cycling in the beautiful Northamptonshire countryside, Silverstone Race Circuit, home of the British Grand Prix and many other motor events. The National Trust sites of Stowe Gardens, Canons Ashby, Farnborough Hall and Claydon. Castle Ashby; the ancestral home to the Marquess of Northampton, Althorpe, the final resting place of ’Diana, Princess of Wales’, Towcester Racecourse, Bletchley Park, once the home of the World War Two code breakers, Salcey Forest Tree Top Walk and an adventurous high ropes course and Bicester Retail Village all within easy reach. Bay Tree Cottage is well located for local wedding venues including Dodford Manor, Crockwell Farm, Dodmoor House, Fawsley Hall and Whittlebury Hall Hotel and Spa. A little further afield but within an hour’s drive is Milton Keynes which is great for shopping, Shakespeare’s Stratford-upon-Avon, Warwick and the university city of Oxford. You will find the shop 3½ miles from Bay Tree Cottage Accommodation near Towcester, with the pub ¼ mile and the restaurant is 1¾ miles from Bay Tree Cottage Accommodation. Foragers Cottage is all on the ground floor. Living area: With 40 Smart TV and patio doors leading to courtyard. Dining area: With French doors leading to courtyard. All properties: Electric underfloor heating, electricity, bed linen, towels and Wi-Fi included. Welcome pack. Utility room with washing machine (shared with other properties on-site). 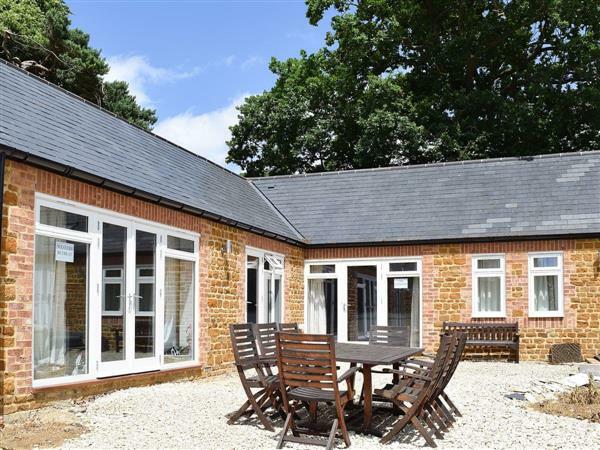 Courtyard with patio, garden furniture and barbecue (shared with other properties on-site). No smoking. Holidays at Foragers Cottage, Bay Tree Cottage Accommodation run from Friday to Friday. For a better idea of where Bay Tree Cottage Accommodation - Foragers Cottage is, you can see Bay Tree Cottage Accommodation - Foragers Cottage on the map below. Bay Tree Cottage Accommodation - Foragers Cottage is in Northamptonshire; should you be on the lookout for a special offer, you can find all the special offers in Northamptonshire. It's always worth checking to see what is on offer at the moment. Do you want to holiday near Bay Tree Cottage Accommodation - Foragers Cottage (UKC3197), you can see other cottages within 25 miles of Bay Tree Cottage Accommodation - Foragers Cottage; have a look to find your perfect holiday location.